October was the worst month for stocks in seven years. It was also one of the ten worst Octobers for stocks ever. However, bonds and dividends helped mitigate the damage. 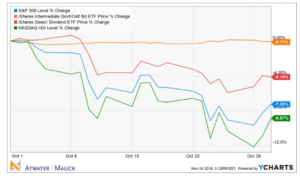 In the chart below, you can see that large cap U.S. growth got hit the hardest, down 8.87% (green line), while the S&P 500 fell 7.28% (blue line), whereas select dividend paying stocks fell a relatively reasonable 4.14% (red line) and bonds basically held steady, shedding just 0.11% (orange line). Although it was a miserable month, it’s been a long and profitable bull market and this one month is but a minor setback. That said, these kinds of months can happen at any time. And we could see more bad months over the course of the next year. We must embrace volatility and realize that investors can earn high returns in equities precisely because they are a volatile asset class. Fundamental portfolio construction – owning high quality bonds and dividend paying stocks in a diversified and disciplined fashion – will become increasingly important if, as we expect, earnings growth peaks in 2018. We will stick to our investment discipline through all markets. It’s the only option for success.